The Eagles almost always are going to throw more than run. 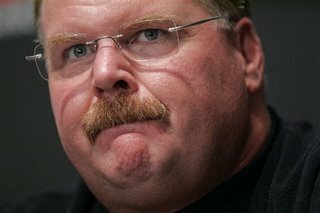 That’s the way Andy Reid wants it. But anomalies like their 39-to-40 pass-to-run ratio Thursday will crop up and tease fans into believing all the Eagles need to win is show a little more love to the run game. There’s conventional balance between the run and the pass, which many teams endorse and then there’s what the suddenly communicative Reid calls “efficient balance.” Had the Eagles not been averaging 4.6 yards per rush against the Cardinals there’s no way they would have stuck with the run. The old school term for efficient balance: run it until they stop it. But you already knew that, didn’t you? The Eagles scratched cornerback Asante Samuel and running back Correll Buckhalter. Both missed practice last week, with injuries sustained against the Ravens; Samuel a neck stinger and Buckhalter a sprained medial collateral ligament. Fullback-running back Kyle Eckel (Haveford) saw his first action for the Birds. (Scratch Matt Ware, the former Eagle. The Cardinals scratched former Eagles Rod Hood and Matt Ware, among others. Hood was replaced in the starting lineup at left cornerback by Ralph Brown. Andy Reid didn't answer the most elementary question after announcing his decision to start Donovan McNabb on Thanksgiving against the Arizona Cardinals. What makes you think the turnover machine still can do the job? "I've been around Donovan a long time," Reid said. "So I trust he'll get his part right and guys around him will." Well, why didn't you say so Sunday night? I mean, that clears up everything. Seriously now, how could he even think he could bring that to a news conference? From what I've heard, the decision to go back to McNabb may not have been all Andy's. But I'm still working on that. Let me say this: there's definitely something going on in that front office. I'd be surprised if more titles didn't change after the season. 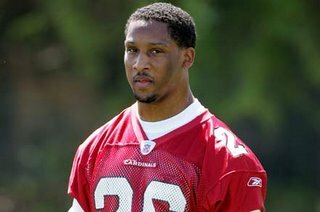 In the how could they do it department, on Eaglesville.com is a conspiracy theory rumor; LB Omar Gaither and TE L.J. Smith lost their starting jobs because they didn't take contract extensions offered by the Eagles. What the author should have pointed out is why in the world would the Eagles want to sign those guys to contract extensions? Both are good quotes but it's not like they've won games. Andy Reid has made his share of mistakes with the Eagles starting with the choice of veteran Doug Pederson as his first quarterback. But one thing Reid has skillfully avoided since getting Pederson off the field and playing his first-ever draft pick, Donovan McNabb, is a quarterback controversy. Quarterback controversies are the worst. 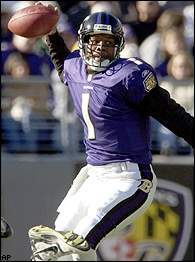 Remember the twilight of Randall Cunningham’s career with the Eagles? After he was benched in 1994 and later sent on his way, Ty Detmer, Rodney Peete and Bobby Hoying all played musical chairs at the position. The Eagles made two playoff appearances in that ugly oft-debated and predictably dull six-year period. It was brutal. Quarterback controversies tear teams apart more than contract disputes, more than disciplinary benching, more than major injuries. The last thing the Eagles need is a controversy which is exactly what Reid is stoking if he puts Donovan McNabb back in the starting lineup after benching him in favor of backup Kevin Kolb this past Sunday. There’s no reason – none – to believe McNabb will get any better any time soon. He is what he is. On Tuesday that would be an aging 32-year-old quarterback who no longer can carry a team by himself. Kolb, on the other hand, quietly has shown the coaches and front office that he’s suited to making the quick reads and throws necessary to run the West Coast Offense. Kolb is smart, he’s tough and those qualities give him an aura in the huddle. 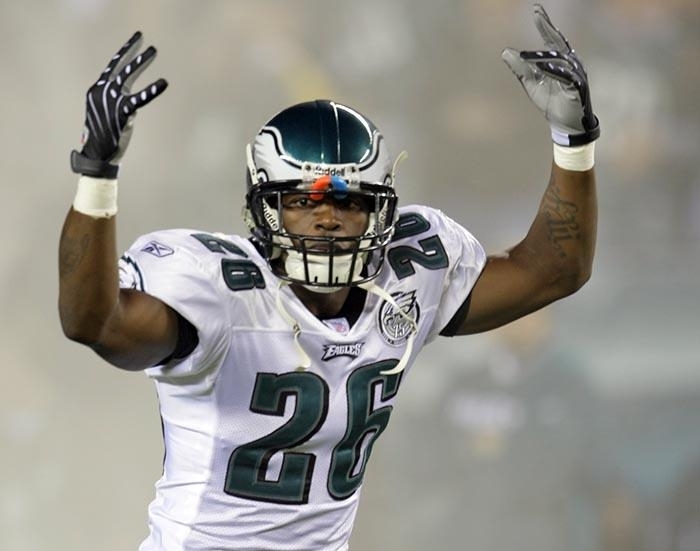 Brian Westbrook says Kolb has it. And for those who think Kolb is every bit the interception machine McNabb has been, nothing could be further than the truth. Kolb, unlike McNabb, rarely makes the same mistake twice. Those picks against the Ravens have been filed under ‘don’t.’ You won’t see those throws again. Reid on the other hand would be making a big mistake, and probably his last mistake if he starts a quarterback controversy. In benching McNabb he realized it was time to turn the page. Putting the veteran back on the field would be saying the coach really doesn’t know what he’s doing. McNabb isn’t done just as Cunningham’s career wasn’t over when he left the Eagles. Cunningham later had an unbelievable season with the Minnesota Vikings that ended one missed field goal short of the Super Bowl. McNabb would surprise no one by following a similar script. 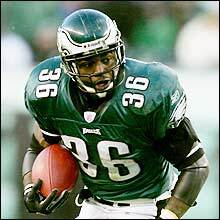 The Eagles backed up their 'no tomorrow' talk in activating banged up running back Brian Westbrook, who didn't practice all of last week with ankle, knee and rib injuries. And in a bid to effect more play-making on the other side of the ball, they started Akeem Jordan at weak side linebacker instead of Omar Gaither. Gaither has 2.5 sacks and one fumble recovery but just one sack in the last six games. The Eagles deactivated the usual cast Sunday: Running backs Lorenzo Booker and Kyle Eckel; guards Shawn Andrews and Mike McGlynn; linebacker Joe Mays; defensive end Brian Smith; and tight end Matt Schobel. Donovan McNabb (above, right) needs Brian Westbrook to win games. When Donovan McNabb gave the Eagles a chance to win each and every start, it made Andy Reid look like a pretty good coach. Reid has won 77 percent of his games with McNabb at quarterback. But McNabb has lost that aura due to age and injury, exposing Reid in recent years as just another coach. 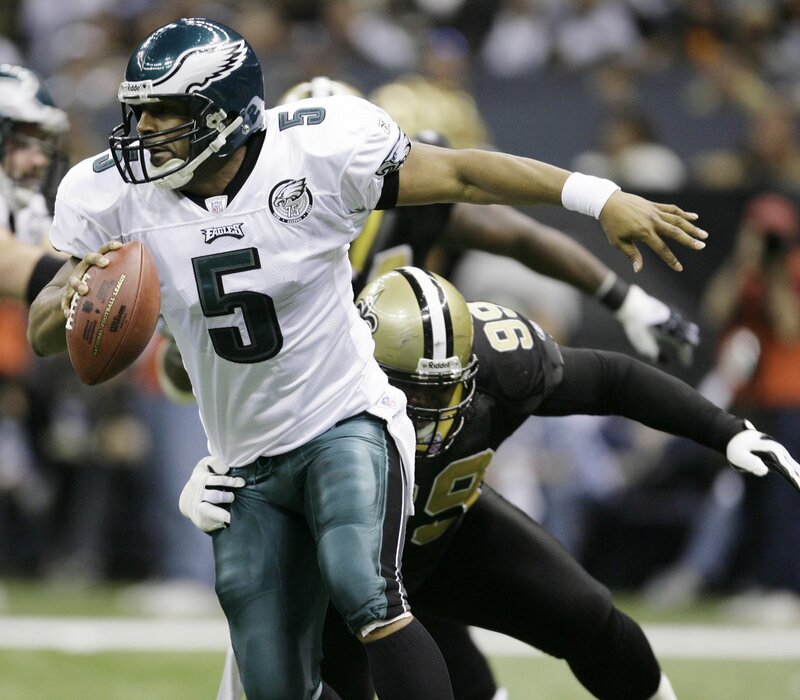 And McNabb no longer seems to have the total package to get the job done with the Eagles. Jeff Garcia had it in leading the Eagles to the playoffs in 2006 and the Buccaneers to the postseason the following year. A.J. Feeley didn't quite have it. If the Eagles struggle today - and a loss qualifies as such - Kevin Kolb deserves a chance to show whether he has it. Brian Westbrook sat out another practice Thursday to rest the high ankle sprain and cracked ribs plaguing him for the last month. Not that the Eagles need him to establish the run game this weekend against the Ravens. Conservatively speaking the Eagles throw the ball 60.6 percent of the time. The Ravens have a top-notch run defense anchored by 6-4, 340-pound tackle Halot Ngata and middle linebacker Ray Lewis. This mistake will haunt Donovan McNabb just as the conflict with Terrell Owens has. This gaffe is another indication - as is the apparent unwillingness of the Eagles to restructure his contract - he has one foot out the door. One of the Eagles' veterans, Sheldon Brown, was surprised after the 13-13 tie with the Bengals Sunday that so many teammates didn't know the regular season overtime rule; i.e. sudden death for 15 minutes, with no scoring producing a tie. Brown cut them a break, though, explaining a lot of them weren't in the league seven years as he was. Then there was the clip of McNabb, the 10-year veteran, on almost every newscast saying he was unaware of the rule and that he thought teams played until a winner was decided as in the playoffs. It's more mind-boggling today than it was when it happened and it's a reflection of his inattention to detail as well as the inattention of the coaching staff. The Eagles scratched running back Lorenzo Booker, fullback Kyle Eckel, linebacker Joe Mays, defensive end Bryan Smith, guards Shawn Andrews and Mike McGlynn, and tight end Matt Schobel. The Bengals deactivate defensive ends Antwan Odom and Eric Henderson, offensive tackle Anthony Collins, tight end Nate Lawrie, wide receivers Andre Caldwell and Jerome Simpson, and defensive tackle Jason Shirley. Frostee Rucker started in place of Odom, sidelined by a shoulder injury. (It only seems as if Lorenzo Booker, above, last touched the ball with the one-win Dolphins last year). Eagles opponents have made a staggering 27 straight field goals, including 16 this season. Four kicks are from 50-plus yards, including a 55-yarder and this year two 53-yard boots. 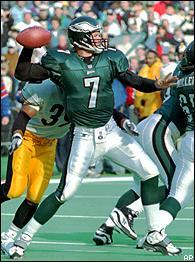 That success magnifies David Akers' struggles from 40-yards and out. Including the 2000 season Akers is 3-for-7 in attempts from 40 to 49 yards, and 5-for-17 from 40 and out. If they didn't know better, some of the Eagles staffers who became acquainted Thursday with alum Al Wistert, the Eagle offensive tackle from 1943-51, would think he was closer to age 67 than 87. Wistert was that impressive during the visit. "Sharp as a tack," 71-year-old director of ticket client services Leo Carlin said. "And, no, I wasn't selling tickets when he played." The teams Wistert played on had enough success to make the day of modern day ticket agents and marketers. During Wistert's tour the Eagles produced a 63-34-4 (.643) record with back-to-back NFL championships in 1948-49. "He's a champion," Eagles director of football media relations Derek Boyko said. Think of the famously catchy muffler commercial, think of anything but understand this and move on - the Eagles aren't going to pay a lot for a fullback. That said stop blaming Dan Klecko and whomever lines up at the position for less than a third of the plays on game days - the Eagles throw the ball 66.3 percent of the time, you know - and start blaming Reid and coordinator Marty Mornhinweg for calling plays that obviously are ridiculously to complicated to execute with the game on the line. How can you expect to run the stretch play that relies on chemistry and rhythm at crunch time when you've barely run it the rest of the game? Dust off the quarterback sweep. Throw the ball to Hank Baskett, who was single-covered. Put DeSean Jackson in the Wildcat and have him run or throw. Don't - repeat, don't - run a play the opposition can see developing all the way from the Meadowlands. No way, no how, not now. ... who hasn't quite developed into the threat the Eagles projected when they dealt a fourth-round pick to the Dolphins during the 2008 draft. Booker has four rushes for five yards and zero catches for zero yards in the last four games. The Eagles also deactivated TE Matt Schobel, FB Kyle Eckel, LB Joe Mays, DE Bryan Smith, G Shawn Andrews (back) and G Mike McGlynn. The Giants scratched former Eagle, DE Jerome McDougle, RB Reuben Droughns, RB Danny Ware, CB Kevin Dockery, S James Butler (knee), LB Gerris Wilkinson (knee), T Adam Koets and WR Mario Manningham. Can’t live with him, can’t live without him. That sums up the Eagles relationship with cornerback Lito Sheppard. Unhappy getting kicked out of the starting lineup and steaming from accusations he’s fragile, Sheppard has tested the patience of the Eagles much of the season. And he’s at it again. Sheppard’s exit Sunday after straining his groin in the first quarter against the Seahawks is a real concern as it eliminated use of the dime package the rest of the afternoon. stake - the Eagles need Sheppard more than ever. Without him they would be at a tactical disadvantage matching up with Plaxico Burress in multiple receiver sets and simultaneously defending Eli Manning’s handoffs to 260-pound power back Brandon Jacobs, which are hazardous to the health of nickel alignments. The sun is back at Qwest Field in soggy Seattle, which has been hit with so much rain the past couple of days even the lattes seem diluted. And they call this the Coffee Capitol of the World? Speaking of diluted, the scratches for this afternoon's Eagles-Seahawks game had a bunch of notables. Wide receiver Jason Avant (trapezius) made the trip but the Eagles deactivated him following the pre-game warmups Sunday. Also scratched were FB Kyle Eckel, LB Joe Mays, DE Bryan Smith and G Mike McGlynn. Tight L.J. Smith (concussion) and G Shawn Andrews didn't make the trip. For the Seahawks, MLB Lofa Tatupu (groin) was deactivated along with DE Patrick Kerney (shoulder), QB Matt Hasselbeck (knee) and WR Deion Branch.